Several days ago I told the story, To See Him, of seeing our son finish Marine Corps Basic Training. I spoke of the washcloth we used to wipe away our copious tears during the Eagle, Globe and Anchor ceremony at Parris Island. But there were two washcloths in this story. You see, the first was used the day he left for boot camp. That day I kept busy, trying to distract myself from what would happen that afternoon. Frequently throughout the day I would go into my bathroom, close the door, and cry into the wash cloth I was keeping in my pocket just for that purpose. After several such trips my son met me at the bathroom door. "Mom," he said with more maturity than his seventeen years would belie, "I want you to be happy for me. I have wanted this for eight years. If I were leaving because I was getting married today, you would be happy." His words soothed my breaking heart somewhat -- is it ever easy to send a child away from your care? I recalled the multiple events that helped us as his parents believe that this young man had found the will of the Lord for his life. If this was the Lord's will for our son's life, and I truly believe it was, then I should have had a great joy in knowing he was following that will. I should have been encouraging and supportive to him. Sometimes the Lord's will for our lives doesn't look as we imagined it would. Sometimes it is wrapped in heartache and pain. Sometimes we are tempted to retreat to that washcloth in our pocket. But the Lord's will always has our best interest in mind. He is always working everything in our lives for our good and in doing so He is always conforming us to the image of His Son. Could I have envisioned what was ahead for my son, and us as his parents, all the special training schools, the deployment to Iraq and Africa -- I might have needed a bath towel rather than a washcloth. Thankfully, the Lord doesn't show us everything in our futures. What He does show us is His unfailing faithfulness. There is no temptation that will assault us that the Lord has not first made a way to escape the temptation. By faith in Him and what He has promised in His word, we can find ourselves safe and with complete peace. We may still need our washcloth some, but our hearts will be secure in the knowledge of our Lord's love and protection for us. the righteous runneth into it, and is safe." Where Shall I Run, Lord? Safe in your hand I will evermore be. though the storms of life almost kill. no other one can provide peace for me. I am left all alone? Have You not said that you would console me? Safe in Your arms I will evermore be. through the storms of life almost kill. I will be fleeing, no other one can provide peace for me. Many of us get our impression of God from what we learned of fatherhood from our own fathers, or grandfathers. Some form an impression of God from fathers they see on television or the movies. What a comforting thought. . .Christ ever lives to make intercession for us! It is not a passing thing for Him, it is not a fleeting thought, it is what He "ever liveth" to do. There will never be a moment -- joyful or sad -- that the Lord Jesus Christ is not praying for us. In this very moment as I am typing this and you are reading it, He is praying for us. If someone asked me what I "live for" I might answer I live to be with my husband and children. Or I might say I live to perform the nursing home services we so love doing. I might say I live to kayak or to hike. These things are my passions in life. But the passion of the Lord Jesus' life is to make intercession for us. When I am tempted, in whatever way or for whatever reason, it is a tremendous thing to remember that the Lord Jesus is praying for me in my very difficulties. I have many dear Christian friends who have told me at various times that they are praying for me. These words touch my heart and comfort me tremendously, but I confess, I do not often remember that the Lord of Lords and King of Kings is in this very instant praying for me. If I did, could it not cause me to, through faith, rise above the difficulty and look for His provision, grace and comfort in those times? Let us each remember that we face each moment, not alone, but with the Lord Jesus Christ whispering our names to the Father through the power of the Holy Spirit. The Lord Jesus said He only does those things which please the Father, so His prayers for us must bring joy to the heart of the Father. Let it be a great source of comfort and encouragement to us all that in this moment, our names are on the heart of God. This week I had the honor of being in one of the sweetest deliveries of my career. The parents were kindhearted, sweet people, the family who loved them were abundant, but not in any way obtrusive and the delivery itself was easy and gentle. A few hours after delivery, I went in the room to check on the mother. The father was asleep in the chair beside her bed and she was cradling her daughter in her arms. I asked her if there was anything she needed and she looked up at me with a face of perfect peace and contentment. Her daughter's face reflected the same and the whole vignette could have been a Renaissance painting. That young mother can never know how much her peaceful embrace of her child spoke to me of the Lord. The Lord desires for us to know we are cradled in His arms as well and there is no safer place for us to be. When our son was deployed to Iraq, friends and colleagues asked me often, "Aren't you terrified?" The truth was I wasn't. So in going to Iraq, my son was being obedient to the Marine Corps Commander, his Commander-in-Chief and most especially, to the Lord. The way I usually answered the question was this, "If it is the Lord's will for my son to go to Iraq, then he is safer there than if he were in my living room." The young mother cradling her baby girl will face countless temptations to fear during her daughter's lifetime. Just because sweet little Caroline becomes an adult does not mean her mother's temptations will cease. No, a mother is a mother for the rest of her life. It is in those moments of temptation Caroline's mother must affirm what she knows from Scriptures to be true and to rest on those promises given to us that the Lord will never leave us nor forsake us. In every trial and tribulation, He is there, in fact, we can not face a temptation that He has not already overcome. We can look forward to the future knowing that "whatever befalls us," as the old hymn says, "Jesus doeth all things well." Glen and I went out walking today, as is our custom. Along the way we stopped at a coffee shop and I used the opportunity to look up some information on my tablet. Because I need a new contact prescription, I struggled to make out the writing on some of the pages I was reading. It was only when we prepared to leave and I was returning the tablet to it's place in my backpack, that I saw my glasses safe in the pocket. They were there all along, waiting for me to need them. Before I needed the glasses, they were already there. Before I realize I have any need at all, the Lord has already answered. It may not always seem like He has answered, but He has. Primarily, He has answered in the form of His Son. "Trust in the Lord always for having Him we have all." The Lord may use various ways to manifest this supply, but the truth is still the same, "having Him, we have all." He is the one thing we need. Surely we will find many times throughout our life that He has supplied needs we never even knew we had at the time of the supply. Then there will be times the supply was there, but we did not avail ourselves of it due to unbelief -- like my glasses. Let us determine to look for the rest of our days at a life filled with wondrous opportunities whereby the Lord has met our every need "according to His riches in glory by Christ Jesus." As we do, our hearts will be more set at peace in the simple assurance that Christ -- our "all and in all" -- is the sum of everything we need. through the knowledge of Him that hath called us to glory and virtue:"
Our seeking after God is never the first step in a relationship with Him, it is a response to His seeking us. I have had a delightful occurrence many times during the thirty-six years of our marriage. Glen and I will be at a social function or meeting and we will be on opposite sides of the room, perhaps in conversations with another person. Then, from across the room, we will look at each other. There is usually a smile, then a reciprocal smile and we will share something that needs no words to be communicated. In this unspoken communication one of us is the seeker, the originator of the moment. The other responds. God is always seeking us, communicating to us. "In Him we move and live and have our being," (Acts 17:28.) Our responsibility is response to His seeking. Our responsibility is to be sought. What a wonderful thought for us to ponder as we go throughout our days! We never seek God apart from His seeking us. Our desire to pray, to worship, to read the Scriptures are always a response to His seeking our heart, for He desires a relationship with us. He is always the one to have the first gaze and we are always the one to reciprocate. This should swell our hearts and humble us at the same time. How much more should it cause us to seek His face and in doing so, find His gaze already upon us. to see if there were any that did understand and seek God." my heart said unto Thee, Thy face, Lord, will I seek." Your face I will seek. And my voice. . . Through our faith in the Lord Jesus Christ, we have a relationship with the Lord God Almighty. We can call "Father" the one who framed the universe, slung the stars in place and upholds it all by the word of His power. He loves us, finds our voices sweet in His ears and it is His good pleasure to share His kingdom with us. If that one truth every catches hold of us. . .if it sinks down deep into our hearts and we allow it to root and grow, our lives can't help but be very, very different. I was telling a friend today the story of when we first saw our son at the end of Marine Corps Basic Training. We had not seen him or heard his voice in three months, except that first phone call home, which lasted for only a few seconds. The afternoon he left, I came home and scoured the computer for information regarding boot camp. I wanted to know more fully what my son was going to go through. I wanted to write him more knowledgeably and I wanted to pray for him more effectively. To this day I am thankful for the dear Drill Instructor's wife who doubtless spent hours and hours following her husband's platoon and chronicling their training. The website she created offered me a wealth of knowledge. The most important piece of that knowledge was that family could attend the Eagle, Globe and Anchor ceremony in the next to the last week of training. This ceremony occurs after a grueling 54-hour training exercise that validates the physical, mental and moral training the recruits have endured throughout their basic training. The recruits complete this event with a nine mile hike from the training grounds to the Iwo Jima flag raising statue at the Parade Deck. They line up in horseshoe formation for this ceremony and at the conclusion they are handed their Eagle, Globe and Anchor, symbolizing their transformation from recruit to United States Marine. We booked a night in the tiny non-military housing on Parris Island as soon as possible. I told my boss that if I had to "crawl on my hands and knees through broken shards of glass," I was going to be at that ceremony. We determined right away we were not going to tell Noah we were coming. If something happened and we couldn't be there that morning, we didn't want him to be disappointed. The morning of the final march we were positioned outside our room to watch the recruits as they all marched by. I thought I would be able to easily recognize my son, but all of them looked alike. Once they passed, we headed to the Parade Deck and the Iwo Jima statute. Try as I might I still could not tell which one was my son. When they lined up, I used my camera lens to search for my son. I had a problem, though, as the view finder kept filling up with tears. I had read to bring a washcloth or hand towel because you would need it. I was glad I had because we passed that washcloth around several times to wipe our tears. At the end of the ceremony, as the now new Marines were heading back to their barracks for a huge meal and a well-deserved nap, we were allowed a quick hug. It has been almost thirteen years ago, but my eyes still fill with tears when I think of that moment. Father and son fell into each other's arms for a long-awaited embrace. I had hoped to have some pithy words of wisdom when I saw my son for the first time, but I could barely choke out that I loved him and was proud of him. Then he was gone again. I never imagined how much I would be affected by this ceremony, the accomplishment of my son, and I having him in my arms again. It was one of the most moving moments of my life. In my heart it is solemn, sacred and almost too dear to tell. One of the great pleasures Glen and I have is getting together with all our children, who are now adults. "We will be at XYZ Coffee shop tonight at 6:30 if anyone wants to join us." "I can't make it until 7:15." "I have a late appointment, but I'll be there about 7:30"
Soon there would be a commitment from all seven (nine if the grandchildren can join us) and before long we are grouped around a couple tables at one of our local coffee shops, our warm mugs in our hands, sharing much more than coffee. Our adult children are more than our children, they are our friends. Now don't get me wrong, we loved -- absolutely loved them-- as babies. They were easy babies to care for and we look back on those times with great joy and tenderness. I have often told others, "If I could go back and hold them just once more as babies, I would." But if they had stayed babies, we would have soon thought something was wrong, even as much as we loved them. As Christians, we are no more to remain babies than we want our own children to do so. We are meant to learn and grow, to become skillful "in the word of righteousness" and to be those who can be called to be teachers of others. The Lord desires sons and daughters who have grown to full maturity in Him. Let us take advantage of His Word, the fellowship of other believers and the guidance of the Holy Spirit so that we may "be strong in the Lord, and the power of His might." One day as we were driving along, I noticed an abandoned house on the corner. The windows were boarded up and the back porch was literally falling apart. It was obvious it had been some time since the house had been occupied. The house is still a house, but it is not fulfilling it's purpose, which is to be a home to a family. Doubtless at one time a family lived here, but now the walls hear no laughter of children and the floors echo no pitter-patter of little feet. As Christians, we too can become empty, broken down houses. While we are still Christians, we have reached a point where we are no longer fulfilling our purpose, which is to glorify the Lord. We have the shell of the house, but the joy and peace and love of the Lord doesn't seem to resound in our hearts and ears. I heard a preacher once say that if we have a problem walking with God by faith, God is not the problem. That is the truth. If we have a problem walking with God, the problem is we do not know God well enough. Once we begin to know Him, what His has done for us, what He is doing for us and what He is going to do for us, then we will want to know Him as well as we possibly can. Our abandoned house would love for someone to come and repair the porch and un-board it's windows. (If houses could really think and feel, of course.) It would love to have a sweet little family sit to eat in it's dining room, and snuggle in to sleep in it's bedrooms. It has the desire, but not the ability to make that desire a reality. Our Lord is for us. He is the great restorer. He is the God of reconciliation. He is the creator of resurrection. If we are not where we should be in our walk with Him, He wants to show us the way back, indeed, He wants to walk with us there. though they be red like crimson, they shall be as wool." For the last several weeks I have been dealing with plantar fasciitis, an inflammation of a thick band of tissue that runs across the bottom of the foot and connects the heel bone to the toes. This condition causes a stabbing pain that is more pronounced with the very first steps in the morning, or after long periods of standing or being seated. Once the foot limbers up, the pain usually decreases. I have used massage, heat, ice, stretching and an interesting taping method to help ease the pain and support my foot. They do help some, but I was in for a surprise. Two weeks ago, I had two events in two days which necessitated me wearing high heels. I expected this to bring on a serious bout of foot pain. In fact, I was wondering how I was going to manage the activities of those two days gracefully while hurting with every step. I put on my high heels and as usual, the first steps of the morning were painful. But after that my feet felt fine. There were a great many steps taken in that day but I never once thought of pain. It was as if I had been temporarily cured. What a great surprise! So often in our Christian lives we are surprised by the grace the Lord bestows upon us, much as I was surprised by the heels leading to a pain-free day. God uses our trials and tribulations to stretch and strengthen us as we walk with Him by faith and time after time we are surprised by the grace we find in time of need. We should never hesitate to turn our thoughts toward the Lord, in times of blessing and time of distress because He desires to meet our needs more than we desire them to be met. He desires us to know His joy, His peace and His love, more than we desire to know them. He desires us to know Him more than we can ever know. that we may obtain mercy, and find grace to help in time of need." 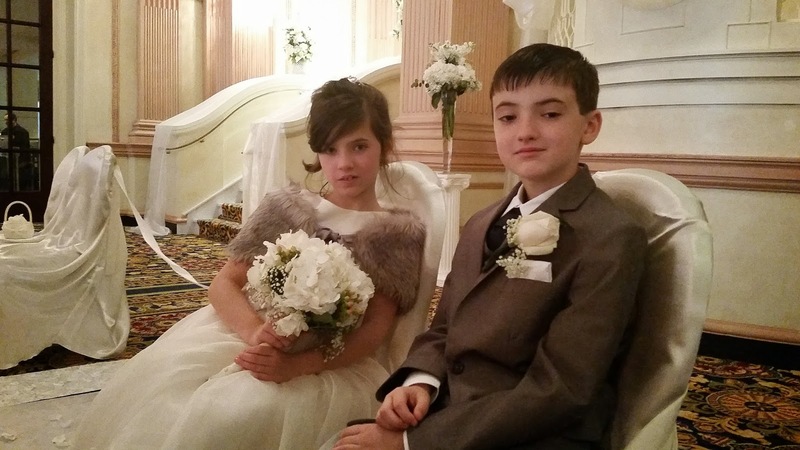 In a recent post I told how our eight-year-old grandson, Jackson, and our seven-year-old granddaughter, Emma, were the Best Man and Maid of Honor at our son's recent wedding. I had a conversation with both Jack and Emma about how special their jobs were and how honored they should be that they were chosen for them. I also told them that they should take these jobs very seriously since their behavior would reflect on their Dad, step-mother and the rest of their family. It was obvious in watching them that they took this conversation (and probably others from their Dad) very seriously indeed. Jack walked down the aisle along side of his dad and took his place to the right of the groom. He stood very solemnly. He handed off the rings at the appropriate moment and the ceremony went off without a single hitch. Emma excelled at her job as well. 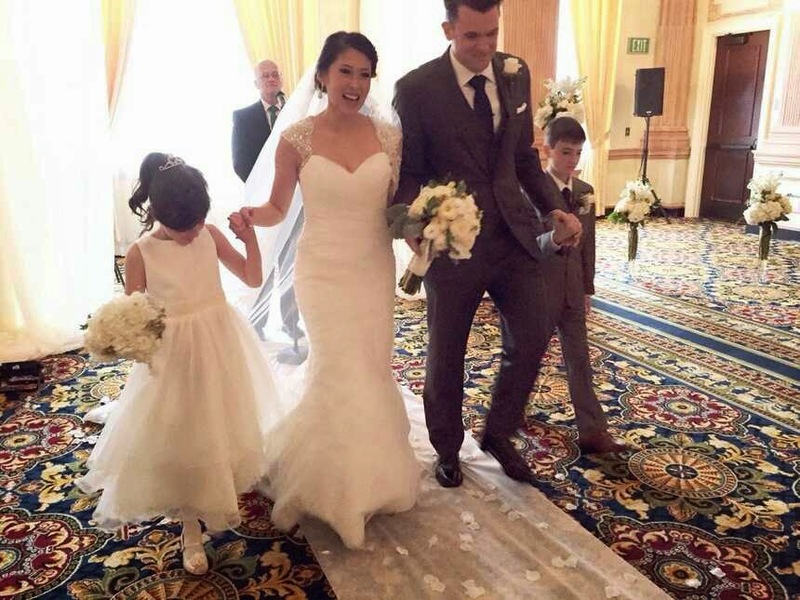 She walked alone down a marble staircase -- the same one the bride would soon be walking down. She gracefully took the turn to the aisle and walked down with more grace, poise and dignity than many brides I have seen. She too, stood solemnly, though usually with a grin from ear to ear, as the ceremony went on. At the point the rings were to be exchanged, our daughter-in-law passed her bouquet to Emma, who was already holding her own, and Emma took it and held it without a single waver. When we come to the point in our lives where we are ready to accept the Lord Jesus as our Savior, we should be just as serious about our lives as Christians as Jack and Emma were their roles in this wedding. In fact, we should be more serious. Our salvation is the freest gift ever given to us, although it cost the Lord a life of suffering we can't begin to imagine. It may be free, but it isn't flippant. If our lives are not dramatically different after coming to know the Lord, perhaps we treated the choice to accept Christ the same as the choice we make between a Coke and a Root Beer. There were many times as a child I fell from my bed in fear of dying and going to hell and asked "Jesus to come into my heart." What I was seeking was something to keep me from hell, not a Savior. It was many years later I fell to my knees in humility and sorrow, this time admitting that there was nothing I could do to produce my salvation, and accepting Christ as my Savior and Lord. Growing up with a preacher grandfather, I well knew the consequences of this choice. When I got up off my knees, the whole world seemed different. I was different. I had been a rebellious, angry teenager until that moment 15176 days ago. I wanted to rebel against every rule and defy every authority. Once I accepted Christ as my Savior it was just the opposite. I wanted to follow every rule and respect those in authority. It wasn't that I was being a better person, it was that I had been created a new person. Making the choice to believe these things are true of us is part of taking our salvation seriously. We must realize that the Lord expects us to "delight in the law of God," because this is what we have be created to do. Just as Jack and Emma stood solemnly at the altar with their Dad, we must take the choices which present us solemnly and seriously. Our choices to delight in the law of God are some of the most important choices we make. We must take them seriously because the Lord certainly does. My family is planting a garden this spring. I should really say everyone in my family except me is planting a garden. While I will reap the benefits, I am really not much of a participant. In preparation for the garden, our daughter Emmie has been planting seeds for the seedlings. She asked me for a envelope of red carrot seeds she gave me for Christmas. I remember putting them away "somewhere safe," somewhere where I knew I could find them. I looked in my jewelry box. I looked behind my jewelry box. I looked under my jewelry box. I looked in my bookcase. . .three times. I could not put my hands on those seeds. "One day, Emmie, you will know the frustration of putting something somewhere so you know you can find it, and then never being able to find it when you need it." She just smiled in response. Finally, she came into the bedroom to help me look. First, she walked over to my jewelry box. "I know I saw them around here the other day," she said as she opened the lid. There, neatly tucked into the top of the jewelry box, were the seeds. I had never looked in the top of the box. The seeds were safe inside the lid all along. Now that's safer than the top of the jewelry box! We are hid. . .hid from anything that would try to harm us. Not only that, we are hid with Christ. Now if I am going to be hid anywhere from anything, the very safest place I can be is in Christ. There is nothing that can touch me there. But it is even better...we are hid with Christ in God. We can rest assured that no matter what storms threaten our horizon, we are safe and secure, hidden with Christ in God. We are safer than we can ever possibly imagine. Thou blest Rock of Ages, I’m hiding in Thee. Have I hidden in Thee, O Thou rock of my soul. Weddings are such special occasions where two families joining through the love and devotion of two people. Everyone usually wears their best clothes and the Bride wears the most beautiful of all. At the wedding we attended last week, the Bride was gorgeous in her long white dress and veil. The Groom was handsome as he lovingly stroked a tear off her cheek as she spoke her vows to him. The Best Man was a dashing lad and the Maid of Honor beautiful as she smiled cheek to cheek throughout the entire ceremony. The Preacher stood in front of them all with a smile of joy on his face. I think this was the best looking wedding party I have ever seen. I am not biased just because the Preacher was my husband and the Groom my son. 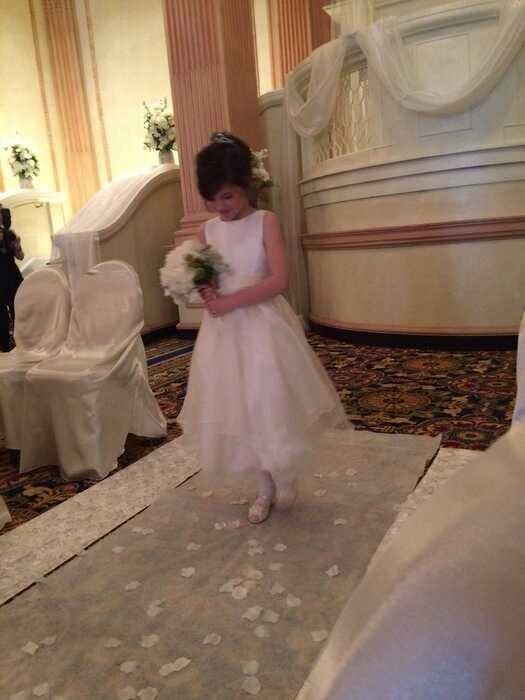 Nor was I biased because the Best Man was my eight-year-old grandson and the Maid of Honor my seven-year-old granddaughter. Well, maybe a little. And yes, I cried through the entire ceremony. I think everyone loves to see a beautiful bride in her sparkling white dress. Most brides love to wear their dresses and hate to take it off. I know I did. There will come a time for all of us who have put our faith and trust in the Lord Jesus to be dressed as a bride. One day we will wear the sparkling white robe of Christ's righteousness, given to us through His death and resurrection and our faith and trust in Him, and Him alone. This fine linen we will wear will be one we will never remove, for it was not made of our own hands, nor of our own works, nor of the hands of others. It was purchased on the cross of Calvary and freely given to us. that we might be made the righteousness of God in Him." We will be His Bride for ever and ever and our joys with Him will be boundless. As a Bride and Groom look forward to the joy of their wedding day, and their new life together, let us also look forward the the Marriage Supper of the Lamb. Let us remember each day that our most glorious, wonderful and beautiful days are yet ahead of us. I want to tell you the story of two coats. They are very similar and yet they are different. Both are blue. Both are raincoats. Both repel water very well. Both have a hood to cover and protect the head. I bought the first one this time last year when we started walking together. It didn't take many walks in our Mobile weather to know I needed a raincoat. As most people do, I bought the raincoat with the specific purpose of keeping me dry when we walked. As our walks grew longer, we began to talk of hiking as well as walking. It was then I realized my raincoat would not be suitable for weather on a mountain. The coat I purchased next was chosen for hiking in the rain. It has features not found on the first coat, because the maker of the second coat made it specifically for hiking in the rain. It has zippers under the arms to aid in ventilation to prevent condensation caused from body heat. It has a mesh liner to keep the coat off your skin if condensation does occur. It also has an inside breast pocket to keep important things, like my phone, safe and dry, but still easily accessible. It even has little loops and snaps on the cuffs for attaching your gloves. I tell you about these two coats because they cause me to think of our Christian life. During our lifetime of walking with the Lord we will doubtless face many trials, many challenges, many moments of difficulty. We have two choices during these moments of trouble and trial. We can trust in our own abilities to manage and face the challenge before us, which, like my first coat, may offer some help, but will not face the challenge perfectly. Our own efforts will always be found wanting. Or we can trust the One who is made unto us everything we can ever need. Christ has not only not left us alone to face these times, He has entered into our very heart, as the Apostle says, "Christ in you, the hope of glory." He is made unto us everything we will ever need to meet every challenge of every day. We can have a good coat to weather the storms of our lives, or we can have the perfect "Coat" in the winds and waves of our lives. Christ Himself is that perfect "Coat." He alone knows the very depths of our heart and knows intimately every detail of every trouble we encounter. We need only to look unto the Author and Finisher of our faith, and to trust that He will be everything we need Him to be in every moment of every day as we trust Him by faith. He has cast His very righteousness around, and indeed, in us so that we can walk faithfully with Him through every trial of every day. As the old hymn declares, "Nothing in my hand I bring, simply to Thy cross I cling."